Off to the Recycling Center! 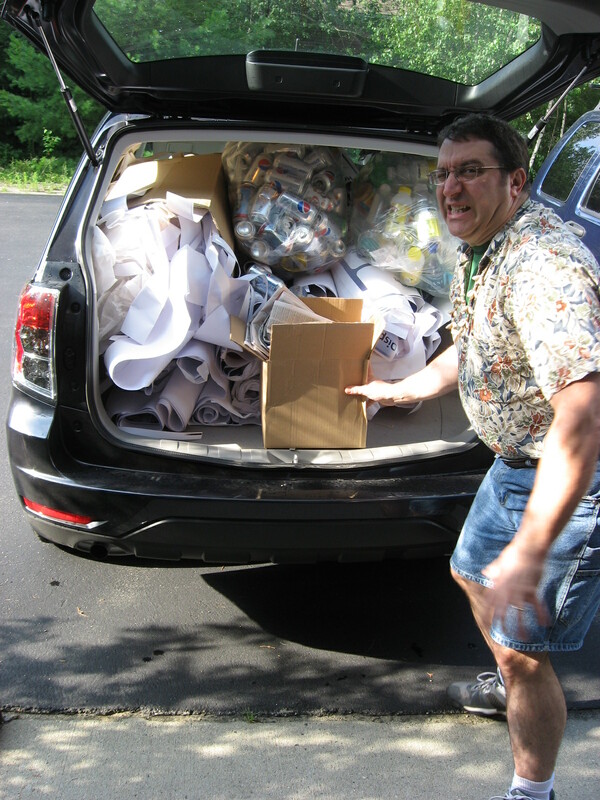 Here’s Bob stuffing the last box into the back of the car as we load up for a recycling run. We have been separating our paper from other trash for the last two years now, and make a trip like this every week or two, depending on how busy we are. We generate a lot of paper scraps from trimming prints to size, running tests, and things that go wrong. It makes us feel good to see that waste being recycled, and it’s kept us from having to increase the size of our dumpster as we have grown. This spring, we installed a flatbed printer that allows us to offer our first truly green product. We can print directly onto a 100% recycled board, and it can be recycled with your cardboard. That means that we keep material out of the landfill at both ends of the process. We’re pretty excited about it, and our customers are too! We also recycle our bottles and cans, our plastic containers, and our cardboard. Being green matters to us, and we hope it does to you too! This entry was posted in large format printing and tagged Flatbed printing, green large format products, large format printing. Bookmark the permalink.